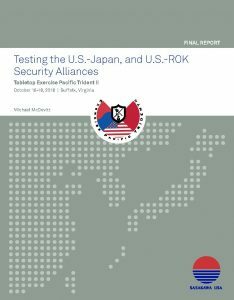 In contrast, this TTX was heavily oriented on diplomatic and policy interactions and included experienced Japanese, South Korean, and American policy, defense, intelligence, and security officials playing in seven separate teams representing the United States, Japan, the Republic of Korea (ROK), China, Russia, the DPRK, and the United Nations (UN). A White Cell orchestrated the entire two-and-a-half-day effort. The exercise was conducted October 16-18, 2018 at Lockheed Martin Center for Innovation in Suffolk, Virginia, also known as the “Lighthouse.” The Center’s expert staff and sophisticated facility were essential to the successful completion of a very complex TTX. Without the dedicated help of Lockheed Martin’s Lighthouse team, this TTX would not have been possible. 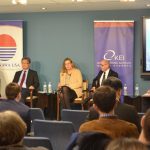 Exercise Pacific Trident II explored trilateral responses to DPRK illicit economic activity in violation of UN sanctions, DPRK proactive diplomacy and efforts to drive wedges between other countries, and internal unrest in the DPRK. The scenario for the TTX was set in mid-2019, six months in the future, so most of the developments were projections of current, real world events. They revolved around Pyongyang seeking sanctions relief, consolidation of its nuclear status, and, above all, regime security.